Love it, looks just like picture . Fabric is thick and looks classy. Give your bedroom a simple and clean allure with the Madison Park Rianon 3 Piece Cotton Waffle Weave Duvet Cover Set. The 100-percent cotton duvet cover and shams feature a waffle weave that provides a soft textured look and feel. The button closures allow you to place a comforter insert within the duvet cover and the internal corner ties prevent it from shifting. Decorative wood button details also adorn the face of the duvet cover and shams for a charming and functional accent. 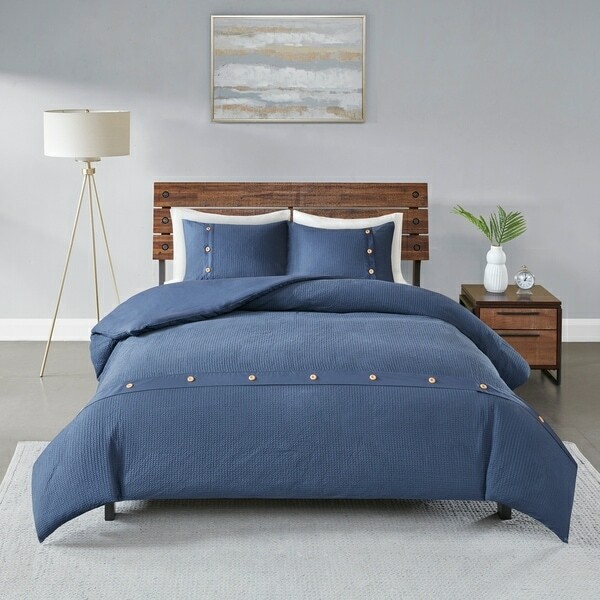 With a fresh contemporary style, this navy duvet cover set is machine washable and pairs perfectly with any bedroom decor. This is exactly how it looks. It's beautiful on the bed. I love the color, and it feels nice. I would definitely order another one in a different color. I may be giving these out for gifts this Christmas. To tell the truth, this is not what I was looking for. I wanted a duvet cover in black, red, and grey. But when I came across this, I couldn't pass it up. I like the weave, and buttons. I may still come back, and look at the Madison park pioneer 6 pieces Herringbone Duvet cover set. I really liked it. Thank you for the fun shopping experience.